NebraskaLand National Bank prides itself on community involvement through sponsorship and volunteerism. That's why we always try to approach things from a community minded point of view. When something is in the best interest of the communities we serve, it's good for us as well. We're community minded, just like you! The greatest gift you can give is your time. Here’s how many volunteer hours our employees have gifted so far this year! Can we help your organization with a donation? Would you like us to join you with our grill at your next event? Submit your request below! Please provide as much detail as possible and attach any support documents such as event flyers, sponsorship forms, etc. Please allow three to six weeks for NebraskaLand National Bank to process your request. For more information or questions regarding your request, please contact: marketing@nlnb.com. Each year, our employees nominate various organizations in our community to be the recipients of monetary donations contributed by the Bank employees. The “My Fair Share” program allows employees to decide what percentage of their contribution will directly benefit each organization. Approximately $126,000 has been donated since the program’s inception in 2004. 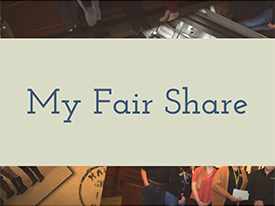 Check out our My Fair Share video from this year! Check out our most recent My Fair Share video! Keep up with our schedule by checking out our upcoming calendar of events! We’d love to have you stop by and see us on location! North Platte area high school seniors are invited to apply for our Financial Literacy Scholarship Program. Each year the program runs from October-April. Since the program’s inception in 2014, we have awarded approximately $31,500 in academic scholarships to local students.